I've been reading The Lord of the Rings to my kids at night, which got me thinking I should look into other fantasy fiction for myself. As a history buff I don't usually read novels, so I have only two reference points for judging fiction: the works of J.R.R. Tolkien and Bernard Cornwell. It might seem terribly unfair to judge a fantasy novel against those two heavy-hitters, but there you go. My new foray into fantasy fiction starts with The Dwarves, by Markus Heitz. The story centers on Tungdil, an orphaned dwarf raised by humans far from his kin. The only knowledge he has of other dwarves comes only from books. This character's isolation is a convenient opportunity for exposition. As Tungdil learns about the lands and the people of the world, the reader does too. Unfortunately, these characters and descriptions are lacking in depth. Heitz' book does not offer a strong sense of place. On his quest Tungdil rushes from one land to the next. Distracted by dangerous encounters, we absorb little detail of his surroundings. The dwarf's relationship with his human hosts had potential, but this storyline was dropped early on. An aging dwarf king involves Tungdil in an intriguing conflict of royal succession. Yet, the plot relies on a standard fantasy device: seeking a magic weapon so the chosen one can destroy the bad guy. Ordinarily in a supporting role, the dwarf is at the center of this fantasy story. I did enjoy reading The Dwarves, I was just expecting more. 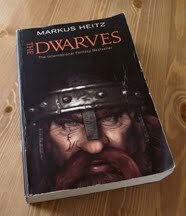 It would be interesting to compare this book to Warhammer's newly published The Dwarfs. I enjoyed the book. Refreshingly it was told from the point of view of a race oft overlooked. However, if you want to enjoy more fantasy books try the Shannara series by Terry Brooks. Start with sword (the first he wrote) or Genesis (the first time we meet the races) or the Knight of the Word trilogy the prequel to the prequel. All very well written and terrific reads. Thanks for the review, I had seen this one in a bookstore thought it sounded interesting. I also recently started looking for fantasy fiction after LOTR and Bernard Cornwell's series. I just started 'The Wheel of Time' series by Robert Jordan. So far its been pretty good. I hope you keep us updated as you find more books you like. Glad you guys are into the fantasy fiction reviews. I'm almost finished reading the next one. I probably should have commented more on what was good about The Dwarves. I won't do a review at all if I think something isn't worth reading. I'll try to be more balanced with my next post. Grimsby, I remember liking Terry Brooks books when I read them as a teenager. Aren't they kind of creepy, though? Glad to know I'm not the only one that gave up on this book. Some good parts (the opening, dwarven crafts and architecture) but the clumsy plot, the heavy handed stereotypes and the one dimensional nature of just about everything made me give it up about halfway through.